Continuing counting down the villains and adversaries on Supernatural that keep our beloved Winchesters busy season to season. So without further adieu let us continue the countdown. 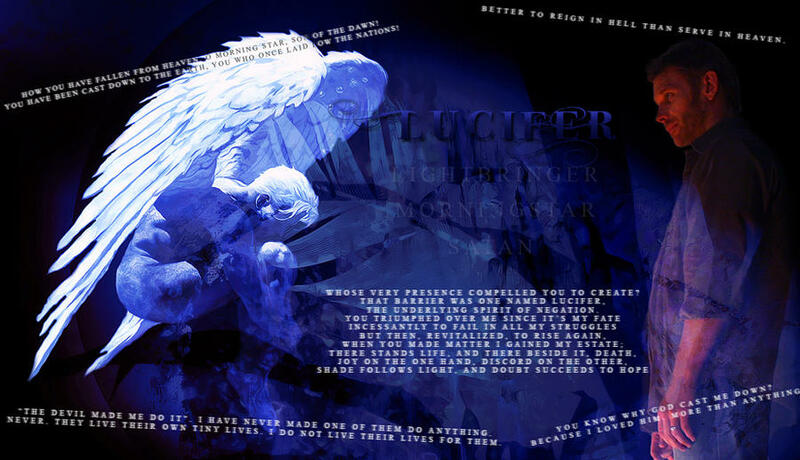 Lucifer, Heaven’s former darling turned Fallen angel. The most pivotal angel in existence who changed the entire scope of Heaven with his actions. He was God’s favorite angel according to Gabriel. Lucifer, aka “The Morningstar” is known to be the most beautiful angel ever. As the second-created Archangel, Lucifer is the younger brother of Michael and the older brother of Raphael and Gabriel. When God asked all angels to bow down to humanity, Lucifer refused and rebelled against his father and his plan. After this he declares war upon God and Heaven, thereby becoming the ruler of Hell and the father of demons. Michael eventually casts Lucifer down and locks him for eternity in a special cage in the lowest pits of Hell. Azazel and Lilith were both motivated by their desire to free Lucifer from the cage. Lucifer takes the cake in this show when it comes to the character with the most Daddy Issues. Which as Gabriel points out in Season 5 a direct parallel to the character of Sam. “Think about it! Michael, the big brother, loyal to an absent father. And Lucifer, the little brother, rebellious of Daddy’s plan.” As pointed out above his whole arc is to get free from the cage so he can hasten the apocalypse and rid the world of humans. He wants to smash the humans he feels his father loved more than he loved him. Lucifer when he is freed is trying to secure his army to be able to take on Michael and the armies of Heaven. It’s a bit ironic though when you look at Lucifer, he could be considered just as big a failure as a parent as God is. Lucifer created the demons “fathered them so to speak. But it’s clear that he holds them in contempt, they are simply fodder for him. When he wipes out a ton of Demon’s in season 5 Abandon All Hope he tells Sam who looks on in disbelief “What? They’re just demons” So he kind of is a bit hypocritical in judging his father when he does worse to his own creation. Love or hate Lucifer, you cannot deny the man had Sass and Charisma coming out the wazoo. A master manipulator seen from his very first scene with his vessel Nick. Lucifer cannot just posses Nick he has to convince him to say yes. Nick is being sent visions by Lucifer of his baby that was killed by an intruder who broke into their home one night. Messing with his head, sending him visions of a bloody crib, baby cries and his child’s swing that moves for no reason. Nick then meets Lucifer directly when he comes as a vision of his dead wife. Lucifer then told Nick some of his origins, such as how he loved God “too much” and felt that God had created them, but only to screw humans around. He went on saying that God was to blame for the death of his family. God could have stopped it but didn’t. Lucifer tempted Nick, (As he does) saying that if he allowed him to take over his body, he would make sure the ones who killed his family would be punished. And now Lucifer has his vessel (The best one too, Mark Pellegrino slays this role. Misha was fantastic as well though.) Not one to sit and rest on his laurels he quickly moves on to his true purpose, seducing Sam to say yes as Sam is his true vessel. He continues his trend and appears to Sam as Jessica. Sam is told that he will always be part of the supernatural, people who get close to him will get killed, and that there is no hope for him. Good ploy actually to play on Sam’s self sacrifice. He drops the facade though as Sam isn’t buying it and plays all the cards out. He still gets denied and goes off. In the next episode The End we got to see Jared play Lucifer. That was a great episode you all need to watch it. The scene between past Dean and Lucifer wearing Sam’s body was incredibly chilling and filled with such despair you wonder how Dean comes out of it with any resolve at all. Jumping back into Abandon all Hope, this one honestly one of the saddest episodes of Supernatural history. The Winchesters have tracked down the Colt, getting it from Crowley. They have reluctantly teamed up with this demon who wants Lucifer dead as he feels Lucifer wants to eradicate all demon kind. The Winchesters take Jo, Ellen and Cas with them to go hunt the Devil in Carthage. Lucifer sends Meg out with hell hounds to track them down. Jo is mortally wounded in the fight. She sacrifices herself with Ellen to take out the hellhounds with a bomb made of rock salt and iron nails. All to give Sam and Dean a shot on the Devil. Lucifer turns out to be immune to the Colt. Honestly making Ellen and Jo’s sacrifice pointless. So damn sad. Lucifer slaughters the whole town, and the demons he made of the men. He does this to summon the last of the 4 horsemen Death. Good people have died, and The boys, Cas and Bobby are all distraught. The best that can be said is that they escaped Lucifer’s wrath, which isn’t really saying much. He makes his next appearance in the episode called Hammer of the Gods. This is where he essentially wipes out all the Pagan Gods that have gathered to discuss the Jude-Christian apocalypse. Gabriel also appears in this episode under his guise as the Pagan God Loki. Lucifer hates the pagan gods’ lack of loyalty and obliterates at least eight of them in brutal until only Kali and the Winchesters remain. Gabriel appears to challenge his brother, as he declares he is on the side of humanity. Lucifer sadly wins the fight and stabs Gabriel in the stomach, but the Winchesters have escaped with Kali. Gabriel still manages to sneak the Winchesters a message that they can trap Lucifer back in the box. Now we land at the Finale Swan Song. Sam has made the decision to accept the devil and attempt to wrest control to jump Lucifer into the cage. It doesn’t’ work (at first) and the battle between Lucifer and Michael is on. Although before we get there, we see just how much Lucifer and his demons have been manipulating Sam is whole life. From there we go to the Cemetery in Lawrence Kansas for the big showdown. Which turns out not to be much of a showdown as Dean, Bobby and Cas crash the party. Lucifer starts to beat Dean but Sam gains control and jumps back into his cage dragging Michael along for the ride. And supposedly this ends the arc of Lucifer. Haha just kidding. he actually comes back in season 7, as a hallucination in Sam’s head. 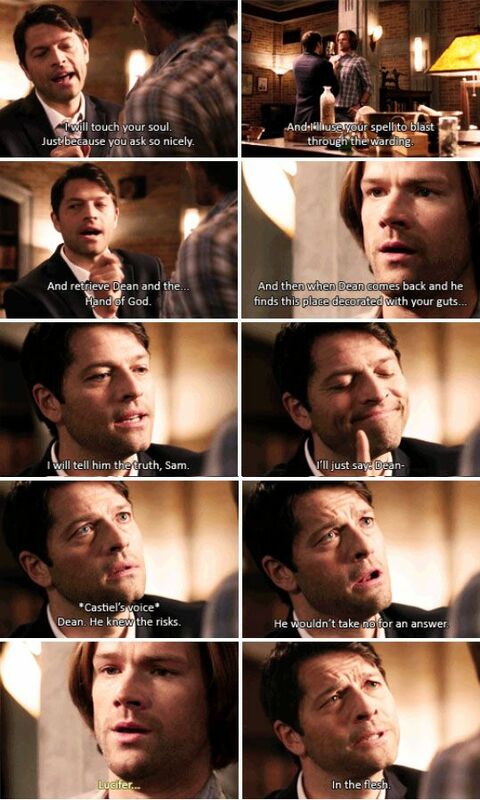 Cas has broken the wall Death built to separate Sam from the trauma his soul went through in Hell. He is basically just tormenting Sam all through season 7. In the episode Hello, Cruel World he almost gets Sam to shoot Dean. Sam manages to keep Lucifer at bay until the episode Repo Man. When Sam acknowledges Lucifer he allows him into his head. No matter what Sam does now there is no getting the hallucination to vanish. He is so loud in Sam’s head he becomes unable to sleep, which gets Sam put in a mental institution. Cas, in a desperate attempt to redeem himself for putting Sam in this position, takes the Hell scars onto himself. Now he is the one who sees Lucifer everywhere and falls into a coma. Lucifer makes an unexpected return in Season 11. Apparently cracks formed in the cage when Amara zapped into the world. It allows Lucifer to communicate anonymously with Sam. He is sending Sam visions of Lucifer in the cage, and for some reason Sam thinks it is God. Which makes no sense to be honest, vague cryptic messages in your head messing with you? Come on Sam that has Lucifer’s stamp all over it. Sam however trusts in the vision and with Crowley and Rowena trap Lucifer powerless in a separate cage in Hell. Unbeknownst to Sam however, Lucifer has also been communicating with Rowena. Lucifer had been promising Rowena to make her his Queen if she got him out of the cage. So I didn’t love the episode O Brother where art Thou though it wasn’t terrible. 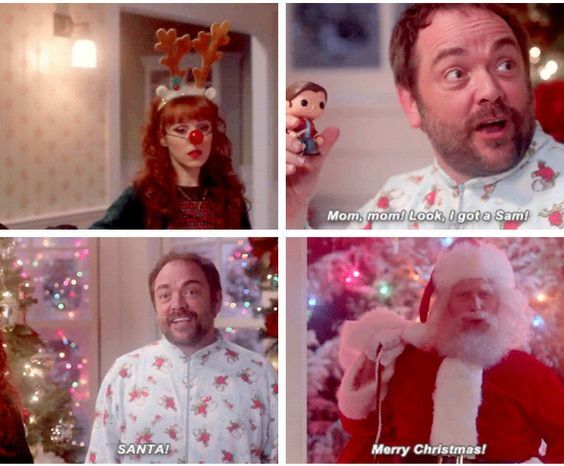 I did however LOVE the following episode The Devil is in the Details because I didn’t know how badly I needed Lucifer playing Santa to Crowley and Rowena in my Life until it happened. Lucifer is trying to get Sam to say yes by walking him down memory Lane. Lucifer insists he’s the only one who can beat the Darkness with Gabe and Raphael dead and Michael having gone insane. Sam refuses, knowing that whoever wins between Lucifer and Amara, the world loses. Lucifer starts to beat on Sam when Castiel and Dean arrive to stop them. Lucifer cons Cas into letting him take over his vessel and here comes Misha in the role of Casifer. And he did an amazing job with it really. Sam and Dean are tricked initially by Casifer posing as Cas. In the episode The Vessel Lucifer has regained control of Hell, and Crowley is his “dog.” He is stockpiling all his weapons to try and deal with Amara. He is also looking for a hand of God, which is something God imbued with his power. Dean calls with a lead on one and off goes Casifer to help. Lucifer loses Dean in the past because the location was warded against angels. He reveals who he is to Sam in future, as he feels Sam is expendable with Dean’s connection to darkness, and attempts to kill him. Before he can kill Sam, Castiel manages to regain control but informs Sam that he can’t eject Lucifer as it’s taking all of his strength to keep Lucifer from killing Sam. Castiel also informs Sam that they need Lucifer as Castiel can no longer time travel. When Dean gets back Sam banishes Casifer out and they ward the bunker against angels. Lucifer goes back on the hunt for another Hand of God, and for Crowley who has managed to give him the slip. Lucifer enters Heaven (finally?) where he meets and kills the angel Jofiel. The angels eventually agree to listen to his command, but an attack from the Darkness disturbs everyone in Heaven.The Winchesters summon him from Heaven. The episode Hell’s Angel gives us an amazing scene where Crowley has teleported inside Cas’ head. He is fighting Lucifer trying to get Cas to eject him. Cas doesn’t reject Lucifer and he gets kidnapped by Amara. Never does lose his sass through all the torture she puts him through. In We Happy Few the episode reunites God and Lucifer for the first time. And it is brilliant. While Sam and Dean are out buying groceries, Lucifer and God talk. God pisses Casifer off, stifling him from killing the Winchesters . This leads to Casifer becoming an out of control angsty teenager hiding in Sam’s room blasting rock music. The brothers managed to get God and Lucifer to sit and talk, during which Lucifer complained that God always acted like he had a reason for everything, and that locking him up for something the Mark caused him to do was his fault, despite Lucifer being God’s son. God and Lucifer reconciled their differences and the Archangel’s allegiance was with his Father again. Amara ends up expelling Lucifer from Cas. We don’t hear from him again until the current season. For those that want to see what kind of chaos Lucifer is bringing to Supernatural Season 12, I invite you to check out my episode Recaps. Episodes 1-4, Episodes 5-8, Episodes 9-10, Episodes 11-12, and Episodes 13-15. Go, read, review and tell me your thought’s on why Lucifer makes a great Villain.